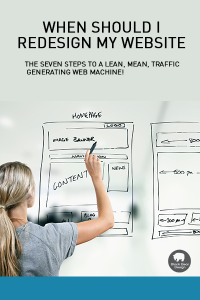 The Seven Steps to a Lean, Mean, Traffic Generating Web Machine! Let this e-book be your guide.This short e-book will guide you step by step and help you determine if it’s time to redesign your old website, or if you should just put new wheels on it and drive it through the middle of rush hour web traffic! What will your customers think? Whats important to look out for? So go ahead, click the button and we will zip it over to your email. Don’t feel bad that it’s free, we love giving away stuff.